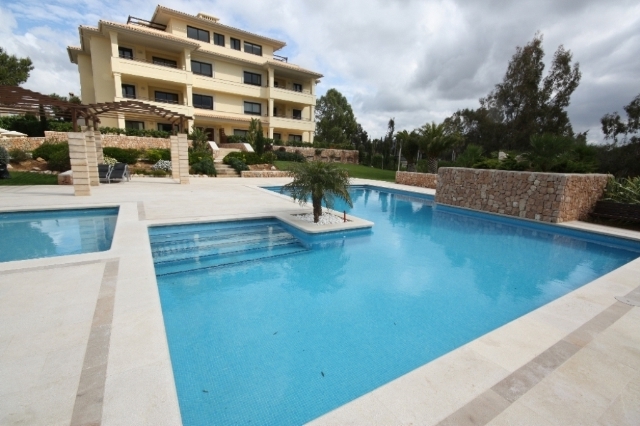 Delightful apartment located in a gated community within Santa Ponsa. With landscaped gardens, private parking, video survellance entrance and three communal pools including terraces this residence really does offer eveything for luxury living in Mallorca. The exclusive marina of Port Adriano as well as the Golf Course are all within a few minutes drive away. The property provides an ample size entrance hallway, leading to a bright living/dining room where patio doors lead directly onto the private covered terrace which overlooks both the communal gardens and swimming pool. The kitchen comes fully equipped and includes all electric domestic appliances as well as a separate utility room. There are three double bedrooms (the master bedroom includes a small dressing area) There are three natural stone designed bathrooms. The apartment has been fitted with marble flooring, AC and heating (reverse cycle throughout.) The property would make a lovey home. Viewing recommended. Beautiful apartment in a quiet, residential area in a prime location! !